ULYSSES ILLUSTRATION WORKSHOP — Discovering James Joyce’s Ulysses through your own illustrations. Saturday, 5 May 2012, 14:00 until 17:00. The Education Studio, Ashmolean Museum , Beaumont Street, Oxford, OX1 2PH. The event is run by ARTISJUSTAWORD. Join in the conversation on Twitter (#ulydraw) and Facebook. Why Ulysses and Why Illustration? Unfortunately, some great stories come in daunting packages. James Joyce’s Ulysses (1922) is a good example. Totalling around 800 pages, the book is not a quick read. And it is often considered difficult, due to its experimental writing techniques. Don’t be put off: Ulysses is one of the best stories ever written. Whilst following two men around Dublin, Ulysses discusses love, relationships, the human body, the human mind, politics, history, art, literature, music, film, and much more. There really is something for everyone. Readers gain intimate insights into the characters’ experiences and thoughts. As well as painting a familiar and accurate picture of human life (warts and all), Joyce conjures up some truly beautiful images, such as the ‘heaventree of stars hung with humid nightblue fruit’ from the ‘Ithaca’ episode. Whether you fancy learning more about Ulysses, or just want some inspiring words to get your creative juices flowing, join us in an innovative (and less daunting) way of reading. We will be addressing this question of whether illustration is a form of interpretation whilst offering an absolute beginner’s introduction to Ulysses and to various illustration techniques and philosophies. There will be two 10-minute talks: one by Cleo Hanaway (an Oxford University doctoral student writing on Ulysses) and the other by Joseph Wilkins (a professional illustrator). Participants will experiment with mono-printing and other techniques as they produce illustrations for Ulysses. We will also hear some Joycean songs, courtesy of Phil Oakley and Chris Beard from Oxford-based band Flights of Helios. Illustrations will be shown in Dublin at the International James Joyce Symposium. A wonderful collection of letterpress prints was created in 2004 by students at the National College of Art and Design in Dublin to mark the 100th anniversary of Bloomsday (16 June), the Dublin day immortalized in James Joyce’s Ulysses. The 18 broadsides, one for each chapter of the book, and introduction from the original exhibit program (see below) are displayed here courtesy of Brendon Deacy of the National College of Art and Design. When I realised that this year was significant in relation to Ulysses I decided to run a project with my Third Year Visual Communication students in celebration of the great novel. I thought that editioning a portfolio of work in the department’s Print Workshop at the National College of Art and Design in Dublin in 2004 would not only be an appropriate way to mark the occasion but would also create a unique document for the students’ future reference of what they were doing at this particular time in this particular place. The plot of Ulysses takes place on 16 June 1904. As this year marks the centenary of what has become known as ‘Bloomsday,’ each student was asked to produce a graphic response by letterpress to one of the eighteen episodes from what is referred to as the most important literary achievement of the Twentieth Century. 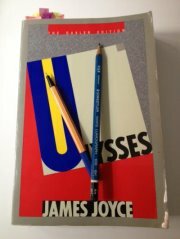 James Joyce wrote each chapter of Ulysses in a different style and the hope was that each student would respond accordingly so that when we editioned the work everyone involved would receive a folio made up of a variety of approaches and styles connected by the narrative and given dimensions. The students approached the project with confi dence when it was explained that Joyce celebrated the fact that the written word is not ‘owned’ by a literary hierarchy so that each reader of Ulysses pictures their own interpretation of the words he wrote. All type was set by hand and all images had to be produced in a relevant media. The portfolio was printed in an edition of thirty, under the guidance of Seán Sills, so that each student received a complete set of the works with six going to various national collections and archives. Joyce’s summary of the plot was, ‘the epic of two races (Israel and Ireland) and at the same time the cycle of the human body as well as a little story of a day (life)… It is also a kind of encyclopaedia. My intention is not only to render the myth subspecie temporis notr notri but also to allow each adventure (that is, every hour, every organ, every art being interconnected and interrelated in the somatic scheme of the whole) the condition and even to create its own technique’. To almost every chapter Joyce subtly assigned a specific Dublin location, a particular time of day, organ of the body, art form or intellectual discipline, colour, symbol and technique, and the students were asked to consider these as well as the universal themes of the novel: journey, relationships and return to home. UPDATE from Wade Linebaugh’s “Poetic Tour-de-Bloomsday” project. Views of the messy Poem in Progress inspired by Episode 3 of Ulysses. Never having attended an academic conference on James Joyce before (or on any literary figure or field for that matter), I didn’t know what to expect when the e-mail arrived this month announcing that the draft program for the 2012 International James Joyce Symposium was ready for review. I had already plunked down my registration fee, booked a room in Dublin, and cleared 10 days of leave from work, all to pursue Ulysses across the sea to see what more could be seen. It’s a voyage I willingly, eagerly embarked on despite one gaping unknown: Would there be enough Ulysses there to make my odyssey worthwhile? Pen in hand, I read every line of the program, circling each Ulysses, Bloom, or Molly in the hundreds of session and presentation titles. I was not disappointed. Ulysses abounds! But what treasures, chasms, puzzles, and minefields lie behind the beguiling titles is another story that will have to wait for another day (11-15 June, to be exact). The voyage at this distance looks promising. I hope you’ll join me on this Joycean journey with the LiberateUlysses project in its many oh-so-social (media) guises: liberateUlysses.com, @2lysses Twitter, and Facebook: LiberateUlysses. Ulysses: The Great American Novel. ‘Kissed, She Kissed Me’: Leopold Bloom as a Willing Object of Love. Ulysses: ‘Noise in the Street,’ Sound of the Self. ‘Through the hush of air a voice sang to them’: The Radio Experience in Ulysses. Parasitism and the Vampire Poem of Ulysses. Ghostly Injunctions and the Relation between Stephen and Bloom. Ulysses, Militarism, and Demilitarizing. Ulysses as an Early Talkie. Bloom’s Radical Pedagogy. Reading Ulysses as a Serial. Ulysses: The Video Game. Stephen’s Parable: An Obscenely Good Dirty Goddess Story in Ulysses. Sleep reveals the worst side of everyone: Somnambulism, Nightmares and Sleeping Paralysis in Ulysses. Walking along the Gutters: Deepmapping and Affective Geography in Ulysses. Secondhand Book: Ulysses’ Immanent Thing Theory.